You can participate in this project by requesting a free plant to nurture and care for. Then, you can share part of that plant with someone else, and they’ll become a Plant Steward too – helping to build a movement throughout the city, and beyond. We are currently working with 10 hardy, easy-to-propagate beautiful house plants. You can learn about them here or use our Plant Picker to figure out which plant is a match for you. Think dating questionnaire for you and a plant! Once you have your plant, please register it on on the site, along with you as its Steward. And yes, you can be a Steward of more than one plant. In fact, we encourage that. Once you’ve registered, we’ll send you information on how to care for and share your plant. We’re a small group with big ambition, so there are many things we need. We need cash and in-kind support to keep this project growing. We’d be happy to work something out to target a specific group of potential Stewards, or supply plants as gifts for your office party, conference or wedding. We want to keep spreading plants and are happy to arrange for group deals. 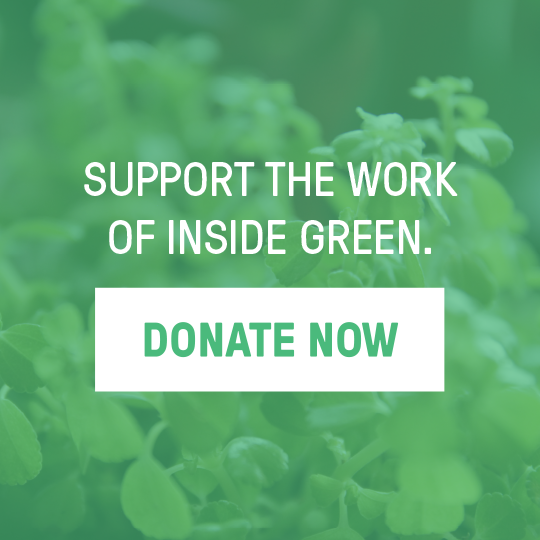 Maybe you’ve already signed up yourself, but are also connected to groups of people who could be Plant Stewards. For example: folks who want to bring Inside Green to their sports group, book club, neighbourhood house, corporate firm as an employee initiative, apartment building, wedding reception, or group of pals! We want all of our pots to be re-directed from the waste cycle. We have found that 4” (10 cm) diameter tins work just great, so we’re collecting those (796ml cans). And we’re interested in any other items that are waterproof and can hold a 4” round plant pot. Please let us know if you have an idea of how we can reuse something from your waste pile! Let us know if you have a green thumb and are be interested in helping Stewards with the propagating process. We’re thinking video conference support or helping us coordinate a few hours at a coffee shop or public space where folks can bring their plants down and have a hands on tutorial.